This summer Black Swan went glamping. It was that singular hot day of summer and there we were, at 2pm, sweaty and playing three-legged races in the middle of Sussex. Toward the end of the evening we were treated to the DJing talents of our CEO, and whilst there was no lack of enthusiasm for dancing, the musical tastes of gen X and gen Y were soon apparent. There is one thing that can perhaps repair this generation X / Y divide ( you can read more about the differences here) – recalling that moment when you lovingly wrapped an iPad or smartphone for a parent, and henceforth became IT support during every subsequent visit or phone-call home. I count myself somewhat fortunate. Whilst my sister and I share IT support duties for our dear mother, we have an incredibly rare breed of father who to this day has never turned a computer on. I’m not joking! In 2015 he continued the long-upstanding tradition of Dictaphone-plus-secretary. Emails are printed and given to him, twice a day, to digest and respond to, by hand. This may seem like an incredibly strange way to interact with an email, yet it would seem that we data scientists interact with messages being passed over the internet in an equally strange way. Our interaction with Twitter is almost as removed; we ‘tokenise, count, and quantify sentiment’. In fact, I’m not sure how many tweets any of us actually read, at least not with any degree of reciprocity to their content. I have a purely mathematical relationship with Twitter. I have composed maybe 3 personal tweets since 2010, but in my role as Research Data Scientist I have been building ways for us to measure ‘Opinion dynamics’ on Twitter. The idea is to work out who are the key influencers in a group, how much attention tweets get, and how much impact they have. This recent report by the Media Rating Council highlights the need for a rethink by the marketing industry on how we measure these things. Simply counting followers and volumes of tweets is a bit naïve. We will follow up with another blog post to explain in more detail the methods we are now trialling in response to this. Is there a group consensus on favourite colour and how easy would it be to change the preferred colour of a group from red to blue? How do you convince a group of gen Y-ers to dance to gen X’s music? How do you convert a baby-boomer to the advantages of Apple products? You figure out whose opinions you need to change, and surround them with this opinion, preferably coming from people who influence them; your boss playing music and all your colleagues dancing, a gift from your child. Opinion dynamics is now the tool of choice for political campaigns. It’s why political campaigns and advertisers make use of YouTube. It’s why Facebook makes so much profit. It’s even the reason Santa Claus changed to Red from Green. Peer-to-peer message passing is more influential than a third party billboard. This is well understood, but we also know that not all peers are equal. Indeed, the social-media peer groups we form behave differently in terms of how they influence us or allow us to have influence. The strength of that peer-to-peer message depends on the relationships between the people; are they peers or in fact does one influence the other. There’s a psychological observation that generally, our behaviour and responses are the average of the 5 people we spend the most time with. So if I want to change your favourite colour from red to blue but can’t change your opinion directly, then instead, if I can change the majority opinion of your friendship group, then magically you may like blue now instead. What has this got to do with Networks, and what is a Network? 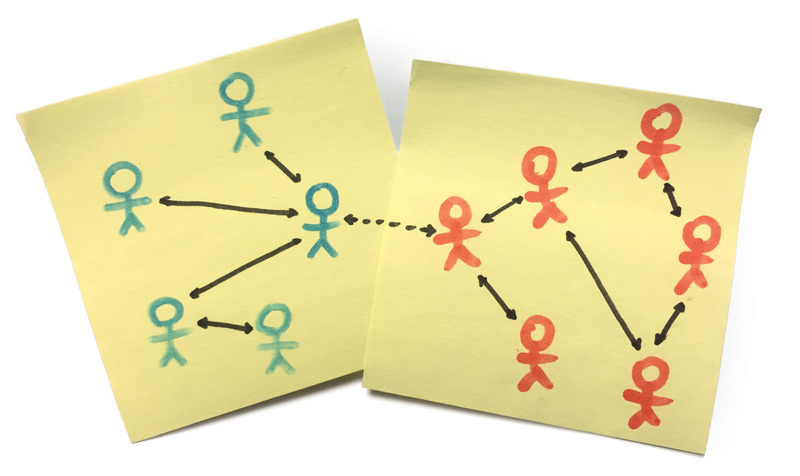 People are connected, and one way to model that connection is with a network. A network is simply a model, and like all models it has to be made of something. Let’s think about a ‘professional network’. We all know what a network is, we are the last generation who think of this as a collection of business cards and the people you say hello to during the week. We are also the first generations to see this transition to a virtual space on the Internet. If each business card is a node, maybe each has a phone-number, job title and maybe also you write the date you met the person on the back. We create a link between you and each of these people. Maybe some of these people work at the same company as you, and you talk with them each day, these are stronger connections, so maybe we weight these as 10 times stronger than those of people you met once. If we think about the projection this has on something like LinkedIn, then each LinkedIn connection is now a node, with lots of meta-data, qualifications, past companies and so on. However, there are still all the connections that you are yet to connect with, so at best your LinkedIn profile gives me a representative snap shot about your professional connections at this moment in time. I can infer that you are also connected to people at your company and you last company (and maybe indeed LinkedIn will often suggest these as new connections for you). Firstly, I can measure the network and look at its structure. I can also rank all the individuals within the network and work out who is influencing who and by how much. I can use this as a model or picture of what the full set of links is like, and I can guess at the links that I can’t see (e.g. do you know this person?). Even further, I can start sending targeted messages, I can try and engineer how my message will pass across the network, or I can try and connect myself more closely to someone else. An example of making a recommendation based on structure is when LinkedIn suggests you can increase your reach by connecting to a certain person. In the Figure below, we can see that if we add the dashed connection then suddenly we can reach an extra 5 people. OK, so now lets think about a Twitter network. The most obvious thing is to make a network of users that, who are connected if they are followers. But how do I then measure the structure and what does this then correspond to? The questions asked before were: Whom do I want to target? How can I reach them? Can I change the network structure? Who can I influence first? For Twitter, however, we found some new ideas for what we can measure from networks. We are making network of mentions (@user1 links to @user2), topic to user networks, (user1 mentions word1, word2, word3) and hashtag networks. We are using the structure of the networks to tell you who is an important user in terms of passing ideas on. We are using network centrality measures to rank the ‘’influence” of users and we are looking at networks of users to topics and measuring something called ‘nestedness’ as a proxy for ‘collective attention’. This helps us track and predict trends on twitter. If you want to know more, please get in touch, we’d love to hear from you.